I'm looking for some help in the area of "Shelf Life" expiration. Does anyone have any experience with utilizing the Expiration Calculation, Quarantine Calculation, Freshness Calc. Method and Shelf Life fields? And if you have experience, how was this functionality used for your business application? 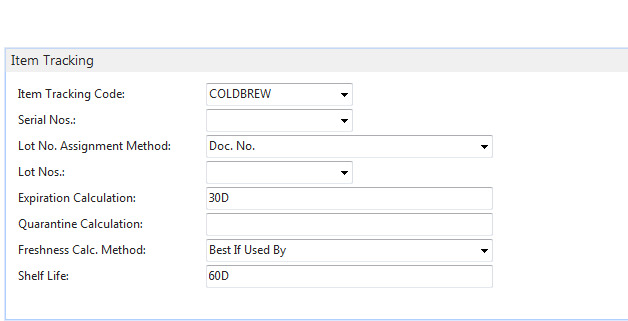 We are a coffee manufacturer on NAV 2015. We are attempting to set the expiration calculation for the specific Item Tracking Code you see here. I have verified thru testing that the sales order will not allow an item to post the shipment after 30 days from the date the item was produced. What I can't figure out is how the other fields are used or how they impact the item being processed on a sales order? Second part to this is we have customers that may want a shelf life of 4 months and other customers for the same item want 9 months. What would be the business solution in NAV to be able to handle this scenario? Any help or guidance would be much appreciated.